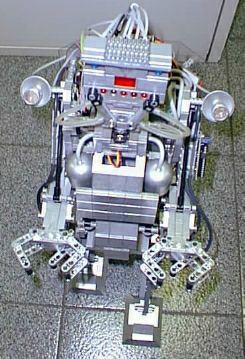 assuring together the Robot's movements. programm for Windows 95/98 S.O. * And whatever your fantasy suggests you. * Ultra-sound Radar for obstacles' and/or presence's survey. graphic Software which does not need any programming. and also through it with voice commands in total wireless system. Wireless Audio transmitter from Robot to PC. Wireless Audio transmitter from PC to Robot.